When you hear the words inflammatory bowel disease (IBD) most people think, “Oh yes! It’s a disease that affects the bowels!” Which is 100 percent correct, but what a lot of people do not know or just don’t think about is that it’s not just a bowel disease, and it is not the same as irritable bowel syndrome (IBS). When people with IBD say they are having major surgery, it tends to be on the intestines, whether it’s removing parts of it or removing the colon completely, and sometimes this means living with a permanent internal or external ostomy. This is where my surgical journey with Crohn’s disease differs from others. I have had four major surgeries with one more coming up this year, yet none of them were on my bowels or even near my abdomen. These surgeries all go back to one source: Crohn’s disease. When I was 17 years old, I finally received a diagnosis of Crohn’s disease. At the time I didn’t know much about it. I just knew it was something that was making my stomach hurt and made me feel really ill. So, my pediatric gastroenterologist started me on a high dose of prednisone, along with other medications to better manage my disease. I was expecting something was wrong with my intestines. This wasn’t the case at all. The CT scan caught the top of both of my hipbones and by pure accident they realized I had what is called avascular necrosis (AVN). I was told they called an orthopedic surgeon who would be in to look at my test results and I might need surgery immediately while I was still there at the hospital. I had no idea what AVN was or what it did — I just knew it was not good. I came to find out that AVN is a very rare degenerative bone disease. AVN essentially cuts off the blood supply to the affected bone, and the bone begins to die or become necrotic. The most common area of the body to get AVN is in the hips, but you can get it anywhere in the body such as the elbows, wrists, knees and ankles. The bone continues to break down and it may eventually collapse, leaving the joint crushed. In my case, AVN came from the prednisone used to treat my Crohn’s flare. So a medicine that was making me feel better was simultaneously killing my hipbones. I was never warned about AVN being a side effect of prednisone. It was never brought up by any of my doctors. Yet, there I was finding out after it was too late. In my case, my doctors said they had never seen AVN develop after only one round of prednisone but that it happened to me. Not everyone gets AVN who take prednisone, and AVN can also be caused by a couple of different things such as traumatic injury, but doctors do not exactly know who will get AVN from prednisone or why. The doctors told me I would eventually need surgery, but could wait. So, waiting I did. My hips progressively got worse over the next two years to the point where I was having trouble walking. It was at this point that I gave in and went to see my orthopedic surgeon. At 20 years old, in my junior year of college, I was told that I needed to have both of my hips totally replaced if I wanted to regain normal mobility. I wasn’t sure how to react at the time, knowing that I needed a surgery that some people never needed, and if they did they were typically senior citizens. One of Aaron’s healed scars. Three surgeries and a year of healing and therapy later, I came out with two totally replaced hips and two huge scars. I don’t often show my scars to people. In fact, very few have seen them outside of my medical team and close family, because they are so huge. Not that I am ashamed of them, it is just that they are hard to look at sometimes. I am however, going to share them with you, because I want you to see a different side of Crohn’s disease and what can come of a disease that is typically just associated with the gastrointestinal tract. Through this time, I had to take a year off from college to recover and regain mobility in my legs. In that year, I married the love of my life, regained the ability to walk, and went back to finish up my bachelor’s degree in biology, which I did. I am now working on a master’s degree in biomedical research. My thesis is on studying how the gut microbiome plays a role in the pathogenesis of IBD, and really getting into the forefront of IBD research. I recently had a setback where I dislocated my left hip by just twisting the wrong way, and I found out that a portion of my implant is failing. Where I thought I was going to get 15 to 20 years out of my replacements, I only had three. 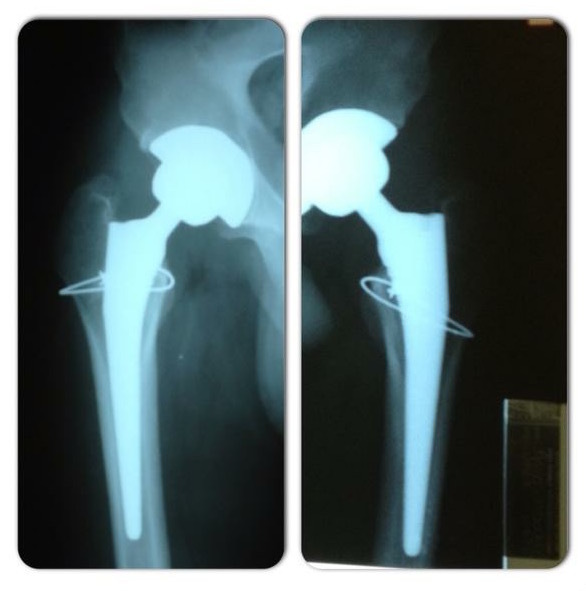 So on March 7, I had a left hip replacement revision surgery and leg lengthening to fix the parts that are broken. I will have one more surgery later this year on the other leg. This is just a minor setback in my journey. I still intend to finish up my master’s degree on schedule and continue into a Ph.D. program to dive deeper into learning how the immune system and diseases work. My ultimate goal is to work in IBD research. A scar from Aaron’s recent hip surgery.